Die struck version with 4 original expansion / braising holes to rear. Slider original. Some slight twisting to one lance tip otherwise in very good condition with sharp detail. Brass gilding metal die struck cap badge in good condition, with original slider and with sharp detail. Circa 3.2cm tall excluding slider. Rare. This small and unofficial brass eagle above a plinth with 105, was ordered privately by the Regiment from a firm in Hythe in the early days of WW1, and was worn until 1919 when the Regiment returned from the Rhine to Hounslow. Officialdom reared its ugly head and the Royal Crest was again resumed. It was not until 1948 that an eagle badge was officially sanctioned. Just type the numbers above into the search bar or navigate to this section via the menu. A WW1 GV pattern brass gilding metal cap badge worn from 1913 onwards with original slider to the reverse (mounted at top of crown). Looks more of an economy strike in quality so possibly issued later in the War. In good condition with some signs of service wear. The Regiment was amalgamated with the 1st Royal Dragoons in 1969 to form the Blues & Royals. K&K Vol 1, Fig. 731 refers. This section has been created as a record of the badges worn by the Regular Cavalry of the British Army during the First World War, 1914 and up until 1922, when many were amalgamated. The badges are listed in order of precedence and each variety worn by Other Ranks is listed (excluding any brass economy badges). Some regiments had to change their badges in the early days of the war on account of the insignia they wore actually honouring the German or Austrian Emperors. The slider rather than lugs feature on all of the badges in this section. The slider was introduced generally for use on most cavalry cap badges circa 1908 - 1910. I will replace sold stock in this section whenever I can. New items will not be relisted as new items on the first page of my site, so if these are your bag, please visit this section often. It can be found in the 'drop down' menu under the heading 'Militaria - WW1 Regular Cavalry Cap Badges'. It is no easy undertaking to put together all these wonderful badges of a bygone era. Remember cavalry regiments did not produce the multiple battalions in WW1 as their counterparts in the infantry did, so they are much more scarce and this is reflected in their price. An early WW1 GV pattern cap badge worn from 1913 onwards with original slider to the reverse. In good condition but dark toned. Scarce. 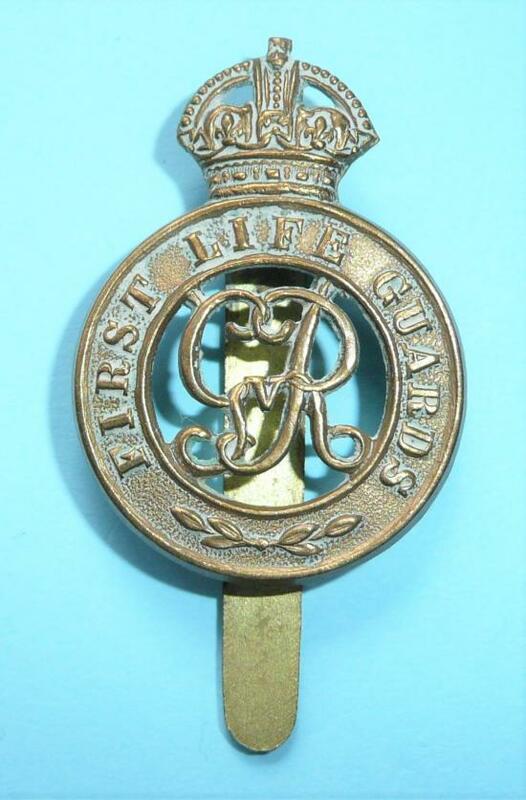 The First and Second Life Guards were amalgamated in 1922 to form The Life Guards ( 1st & 2nd ). K&K Vol 1, Fig. 727 refers. 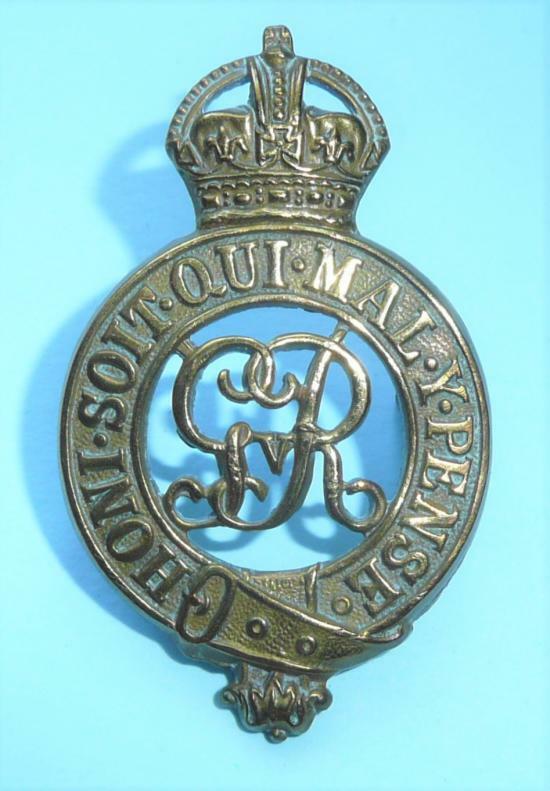 An early WW1 GV pattern cap badge worn from 1913 onwards with original slider to the reverse. A good striking but with traces of dry polish and also some detail to the crown polished. Scarce. K&K Vol 1, Fig. 728 refers. An early WW1 GV pattern bronze cap badge worn from 1913 onwards with original slider to the reverse. A really good sharp striking in excellent good condition. Scarce. A large oval badge with a bronzed finish and with original slider to reverse. Circa 5.7cm tall. Strictly not a cavalry regiment, The Household Battalion was raised as an infantry battalion in September 1916 from reservists of the Household Cavalry ( 1st and 2nd Life Guards and Royal Horse Guards ) and served on the Western Front as part of the 4th Division. K&K, Vol 1, No 733 refers. An all brass cap badge in very good condition with original slider. Scarce. The 1st Dragoon Guards wore until 1915, the brass eagle from the Arms of the Emperor Francis Joseph I of Austria who was their Colonel-in-Chief from 1896 to 1914, with title scroll below. With Austria being aligned against the allies in WW1, his insignia was discontinued in 1915, and replaced with a bi-metal eight-pointed star until 1937, when the brass eagle was resumed but without the scroll. The Regiment was amalgamated in 1959 with the Bays to form The Queen's Dragoon Guards. K&K Vol 1, Fig. 734 refers.